Perma Master Coat- RI is a high build, heavy duty industrial coating based on epoxy resin and hardener. Perma Master Coat- RI is especially developed to provide anti corrosive protective coating to metals and concrete surfaces which are subjected to aggressive chemical atmosphere. The product is supplied as a two-pack system comprising of dark red base and hardener. It requires only on site mixing to produce an easily applied decorative and chemical resistant finish. 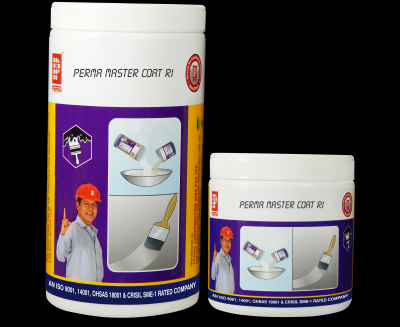 Perma Master Coat- RI coating can easily be built up to higher thickness by subsequent coats. For the external and internal protection of metallic surfaces as well as concrete structures which are subjected to chemical atmosphere. Perma Master Coat- RI is resistant to continuous spillages of water and hence suitable for application on marine structures. the color of the coating is dark red and gives an aesthetic look.